This case comes from the Provincial Court of Alberta, with the judgment having been released in March 2018. Ms. Eustaquio (“Ms. E”) is a 60-year old Canadian citizen with no criminal record. She has two elderly parents who are in their mid-to-late 80s. The deterioration of Ms. E’s father led to Ms. E supporting her niece. Mari Ann Gantuangco (“Ms. G”) to apply for a work permit. In 2015, Ms. E supported Ms. G’s permanent residence application as part of the live-in caregiver class per s.133 of the IRPR. Ms. E supported the applications through an employment letter – signing a statutory declaration and declaring hours of work. In reality, Ms. E’s representations were not true. Ms. E’s parents were out of Canada in the Philippines for six months and the United States for thirteen days, contrary to what was stated on the employment letter. In this matter both Crown and Defence supported relatively lesser penalties, with Crown suggesting a suspended sentence (with probation0 and the Defendant’s counsel suggesting an absolute discharge was appropriate. Justice Fradsham reviewed several recently cases (nationally) from 2013 to present day and as well looked the appropriateness of a conditional/absolute discharge. I am of the view that when all the factors are considered, it would be contrary to the public interest to grant a discharge to Ms. Eustaquio. A discharge, in the circumstances of this case, would unduly undermine the immigration system as it relates to those seeking permanent residence status. A discharge on the facts of this case would prevent the attainment of the sentencing objectives of general deterrence and denunciation. Judge Fradsham also chooses not to follow Crown’s position and instead imposes a $1000 fine (with CDN $750 reduced due the 55 hours of community service performed. With auditing of Express Entry applications and other employer-based support letter becoming more and more frequent, it is foreseeable that there will be more cases of employers (especially where family or closely-held business) being scrutinized. While a majority of these cases will likely result in misrepresentation against the immigration applicant as the end of the enquiry, particularly where the employers are comprised of Canadian citizens and in order to denounce and deter this type of conduct, I do suspect more cases to be brought forward. Ms. E was on the generous end of sentencing – she did not seek to do this primarily out of financial gain but instead to help a family member. I don’t see as much generosity being shown where an Employer is actively reaping benefits from an individual (e.g. some sort of payment in lieu of work). Almost two years ago, I penned a widely-read piece on my belief that the media needed to be responsible in penning case of individual immigrants for fear of inaccuracies and long-term consequences for the immigrants involved. Some disagreed with my stance, but n sharing those different perspectives I felt it was a fruitful debate. Overall, the last two years has reaffirmed that, where possible, less public exposure to the sensitive situation of my clients is generally a good thing. In a few cases, where I believe media attention would further their case and shed light on gaps in the system, I have shared their stories, with their permission, and done so anonymously. Doing this, in my mind, has struck an effective balance of privacy and progressiveness. Unfortunately, in the larger context – media attention, particularly on non-positive immigration stories has ballooned into a regular occurrence. In the past several months, I have noticed a somewhat modified trend of “news reporting meets commentary” that I believe has had an harmful effect on new Canadians and immigrants. This is particularly true in stories originating from Vancouver. The context of these new “news meets commentary pieces” is entirely understandable. Economic uncertainty particular around jobs and education, gentrification and the crowding out of Canadian metropolitan cities, and a general and well-documented “anti-immigrant” sentiment have become accepted as part of our mainstream social psyche. These articles draw attention and are a catharsis for our own social challenges as local residents (whatever that definition is now). It gives us something to blame other than ourselves for our current predicaments. Unfortunately, this process also creates “othering.” I am firmly opposed to this bandwagon/groupthink mentality – having recently written about why I believe international students, as a specific subgroup, should be better understood in context of their challenges rather than simply through lenses of the far-reaching social and economic stigma that have been applied through mainstream media. Through reading these pieces, I have come to the conclusion that some journalism that is currently being produced about immigration is stoking the fire of outrage in a very, deeply irresponsible way. I believe it does so in several ways and through several committed fallacies. First, it is the logical fallacy of proof by example which also combines elements of arguments from ignorance (we have no proof otherwise so it must be true) and arguments from repetition (reusing and recycling of examples to paint a larger argument). For those not familiar with immigrant communities or in interacting with several different immigrants rather than as one silo – it is easily to miss this point. In my practice, I have dealt with hundreds of cases – no two of which I can say are even remotely the same. As a practitioner, one of the first things I make sure to do when seeing a client is leave all my preconceptions, preconceived notions, and prejudices aside. I also take myself and my own background out of my analysis framework. Sure, I bring my experiences with other individuals who may be in similar shoes but I know that each individual immigrant and each narrative is different. Without taking such a lens, it is easy to tag the issue of fraud (for example) to the individual’s country of origin, but when I dig deeper I realize it is the sub-issues – the age of the applicants, their family status, their marital status, even sexual orientation that play determinate parts in the unique situation an individual faces. It is through this lens that for many of my clients I fight their cases because I believe the Government made mistakes in their assessment. Often times, our review or challenge of immigration refusals is where we believe the individual circumstances of the case have not been considered by officers in deciding their case. Stepping back to journalism, I see a similar logic taken by these authors in wanting to paint a picture that places the individual in a larger context. Unfortunately this creates larger, harmful generalizations that can be seen through calling something a “Chinese immigration” problem or automatically pinning one example to a larger cultural phenomenon such as East Indian arranged marriages. Some media may think they are being cheeky in the manner in which they present this perspective, but it is all too visible for those of us that have experienced the subtlety of discrimination and prejudice. For example, while it is no longer tolerable in mainstream media to go out and say that all individuals with Chinese citizenship are fraudulent or all East Indians arrange their marriages writers and editors now utilize bold “catch all” headlines, feature photos showing a particular ethnic group, or paint verbal pictures and links leading to the same conclusion for the reader. Actual discrimination and implied discrimination are the same thing. Furthermore, it’s about the quality of these examples. An East Indian newspaper contains an advertisement seeking purported immigration fraud or one international student who owns a multi-million dollar house while not attending classes, cannot simply be deemed to be a representative of the larger whole. For example, if I opened any local newspaper’s classified section and saw the illicit services being advertised or trusted every single email I received from a Nigerian prince and believed the source as credible, I would probably have a serious distrust of most of the population. As a counterpoint to the fallacy by example, I believe the media has a responsibility to do a better job of quelling this by reporting on more positive immigration stories and not just individuals who are facing deportation. Lost in the narrative are the fact that international students, many who came from poor upbringings, are in fact some of Canada’s leading students, starting up Canada’s next entrepreneurial venture, or are in marriages with Canadians that bring together culture and diversity in such ways impossible in other countries. Sadly, these stories are becoming fewer and further between. It is becoming more convenient to paint a few bad apple as an infected orchard and for the writers to assume the position of farm owner and immigrants as the indentured workers. This narrative is unfortunately so far removed from the realities of not only what is happening on the ground but from Canada’s own history through indigenous roots. Second, for some reason there has been appeals to authorities that some journalists have weaved together in ways that stop making sense. One recent piece named as an immigration specialist on the issue of marriage fraud, someone who I have never seen at an immigration conference in my life and who I have spent the last two years digging a case out of the depths of hell, in part, because of that individual’s recommendation of a fraudulent marriage. It is simply not good enough for a journalist to find experts who share the journalist’s narrative on an issue without providing a deeper canvas of alternative opinions – unless they want to hold the piece out as a commentary rather than as a balanced news story. Consequentially, I would suggest that, on the matter of immigration, we need to get back to reporting fact as fact and opinion as opinion. This molded opinion as fact/news story is simply not working for anyone. With the merger of metropolitan media where two papers essentially are owned by one, there has become less room for the progressive debate and opinion pieces. Finally, to immigrant communities – it is time for you to speak up. If you read a piece that you believe has misclassified your community or your loved one’s community – starting writing, start challenging, and start sharing your perspectives. The fear of silence, of your words leading to you being judged, are exactly the fears that the writers of these pieces are banking on to cement their own opinions. Don’t let this happen. The best way to combat the experts and pundits, many of whom are so far removed from the actual lived experiences, is to provide those experiences. Through storytelling, we can also angle to those important decision-makers – who spend their days basing their political opinions on newspaper headlines, that there is far more to the stories than is currently, presently being told. Writer’s end-note: I initially wanted to share this opinion in a mainstream media piece but I have decided against it as the content itself is critical of the current approach to immigration taken by several mainstream outlets. Should any of you wish to publish this in a mainstream outlet – contact me and I will give you full permission. This piece also is removed from any position I currently hold as an advocate for equality and diversity and represents my personal views only. True to form, even with the leniency period having been extended until September 29, I have started to see the eTA program became a major barrier for several foreign nationals seeking to enter Canada. These are individuals who prior to the introduction of the eTA had no problem entering Canada and are now flagged by the eTA’s computer-generated system. The fundamental theory behind the eTA is I think an agreeable one. Up until recently, Canada had no way of tracking the entry of foreign nationals until they arrived at our Borders. Without information in advance, it was difficult for a Canada Border Services Agency officer to prevent individuals who were inadmissible to Canada, Specifically, I am a fan of asking an Applicant to self-disclose where inadmissibility issues are involved. This is preferable to solely using information sharing and creates a more transparent, fair system. Beyond the Border: A Shared Vision for Perimeter Security and Economic Competitiveness initiative. Needless to say, it won’t go away anytime soon. Particularly with Canada having recently added several countries, most notably Mexico, to her visa-exempt list, I suspect the processing of eTAs will only be more scrutinized and lead to more challenges moving forawrd. Currently, the eTA system runs like a self-declared online survey. Here-in lies the first problem, in my mind. Given the importance of the information contained within, and the fact that an individual is expressly warned that they made be responsible for misrepresentation if they provide false and inaccurate information, I believe the system needs to require everyone to create a MyCIC account and to submit this application through a secure portal. Right not individuals who create eTA profiles and then wish to “link” it to their MyCIC accounts have to jump through multiple hoops to request the linking, often leading to long delays and sometimes even refusals. The second issue, is that the questions themselves do not lend themselves to enough space for an individual to explain themselves. Under the current system, it appears that refusal of entries or visas to other countries are enough to trigger the longer process. However, not enough space is provided to adequately explain situations, particularly for individuals who may have a long travel history with more than a few, non-consequential refusals. Similarly for criminal charges or arrests, there is little room to adequately explain why an individual may not be inadmissible. One must essentially submit an eTA to await a battle rather than be able to pre-empt the concerns as they would be able to in a temporary resident visa (“TRV”) application. The third issue, once an eTA application triggers a request for further information, is that the time provided for such a response is painfully short. Seven days, particularly where linking an account itself can take two to three days, does not provide enough procedural fairness. – particularly where allegations of failing to disclose refusals or suggestions that the Applicant does not have adequate ties to their own home country or proof of funds comes to play. 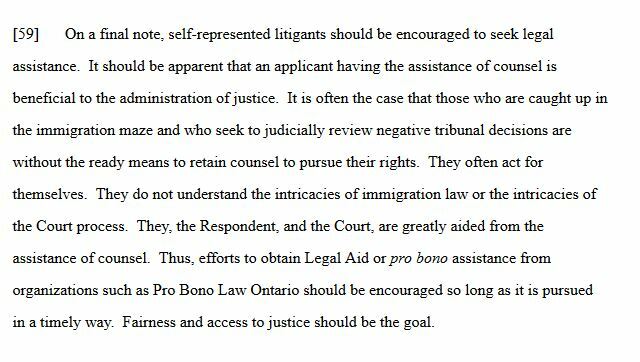 The larger theoretical question, issue number four, is why for individuals who have refusals or inadmissibility that may not at all be related to Canadian immigration (e.g. a refusal from a third country with an entirely different immigration system), suddenly transforms the eTA into a Temporary Resident Visa application. 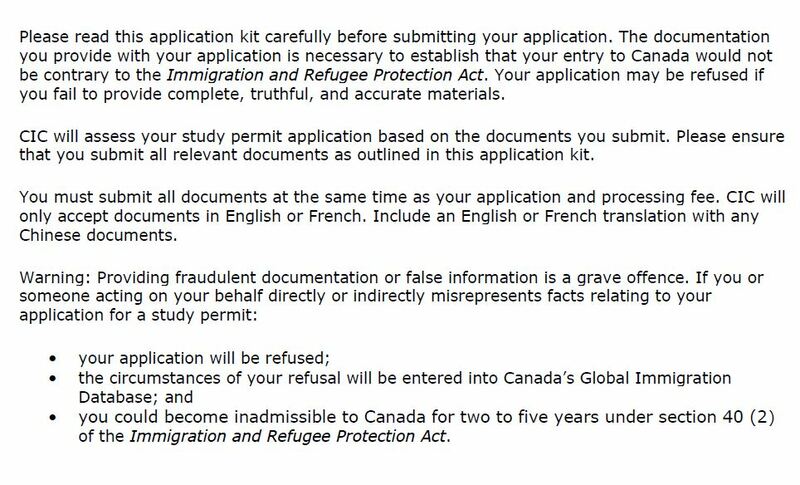 In my mind, an individual who has not found inadmissible to Canada should not have to submit the same (and in reality even more documentation) than an individual from a TRV-exempt country. I don’t think, for example, that an individual’s history of refusals to the United States, Australia, or the U.K. should have an automatic baring on their entry into Canada. This is where, I think it should be left up to Border Services Officers to allow the Applicant in after questioning at the Border. I have already been contacted by a few clients who had previously traveled to Canada on a regular basis with no problem, triggered now only by the eTA system’s survey of past refusals from other countries. I think if the eTA system itself already triggers a warning and advises the passenger that they will be asked further questions at the Port of Entry that this should be enough to serve the eTA’s dual deterrence and expeditious processing purposes. I do also note that the way the eTA system currently works, there is no room for an Applicant to upload counsel’s submissions. There should be another column allowing for additional information to be submitted by the Applicant. The fifth, and final issue, is timing and communication. The way the eTA is advertised now as a seven dollar application that should be processed in minutes gives the impression that an applicant can complete this process a day or at the most a week before their flight. In reality, this process can be a battle of attrition and there are no clear timelines or processes to appeal or seek expedition. 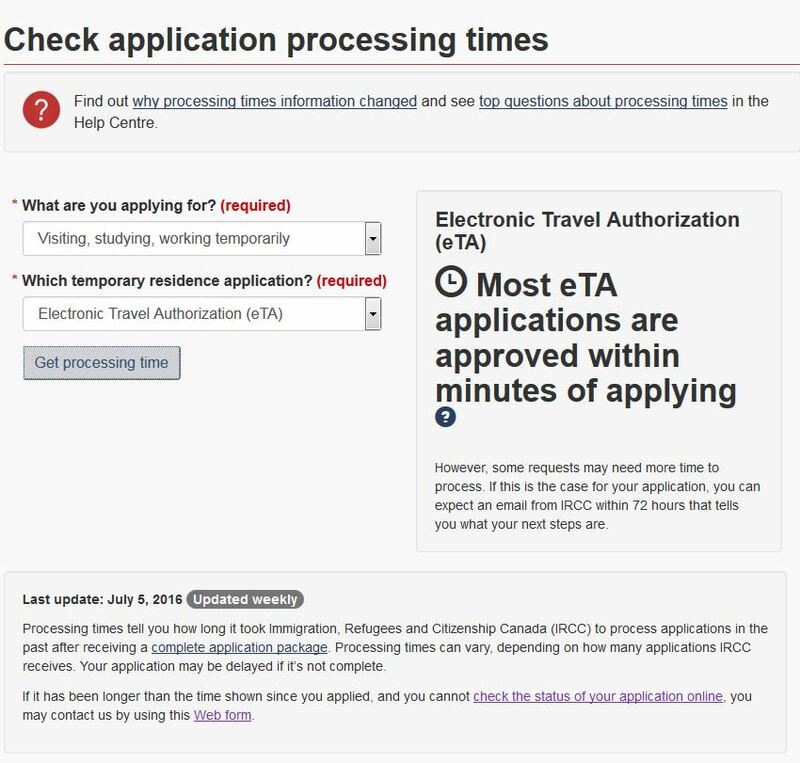 I don’t think judicial review should be the administrative solution to eTA refusals and I think IRCC should implement some sort of review/appeal process to ensure the eTA does not begin to hinder the important global mobility processes that occur every day. Like any new system, I think the eTA is a work in progress. I think the rationale is fundamentally sound but the execution can be improved drastically. 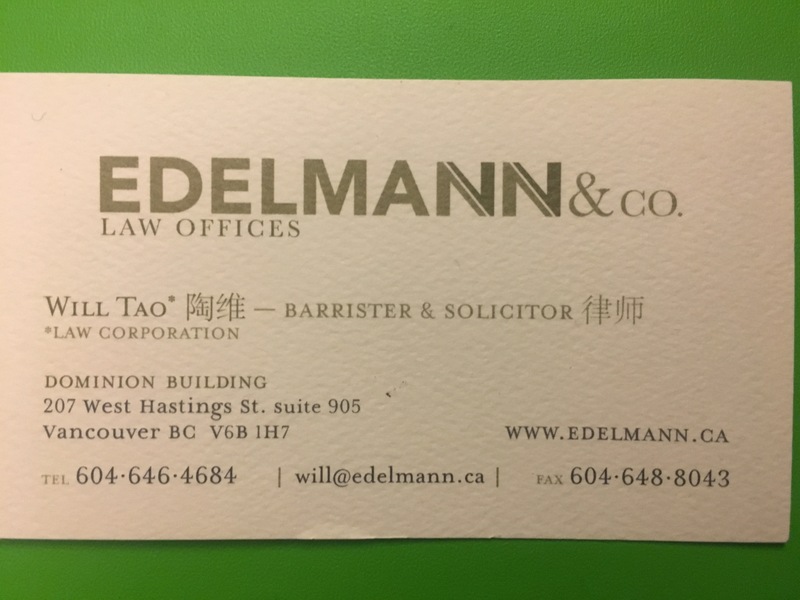 Five Tips to Paper Trail Like a Canadian Immigration Lawyer! I have been very busy. Still there are no excuses I realize I owe about a billion posts for my one month hiatus. This represents the beginning of my seeking for forgiveness from my faithful readers/followers. I wanted to put out a post today that will help self-represented litigants dealing with immigration. I have several of these types of clients who a post like this is directed at. Good/working class command of the English language, a basic understanding of the immigration system, and possibly without funds to hire a lawyer to larger engagement unless a problem occurs. However, this is also a group that may be very prone of falling into traps or being the victim of administrative mistake. I really like this quote by Prothonotary Kevin R. Aalton in John v. Canada (MCI) 2016 FC 572. The underlying decision was a successful extension request for time to file an applicant’s record. Like with any job, there are obviously some tricks to the trade that I can’t share. These are best strategies for which we provide a value add as legal professionals and by which we carve our living. However, in my mind, a well-functioning immigration system is not one where 90% or even 60% of applicants should have to speak to a lawyer. This is a system-made for the layperson and I want to give some advice (non-legal/substantive) that can help you organize your immigration file. 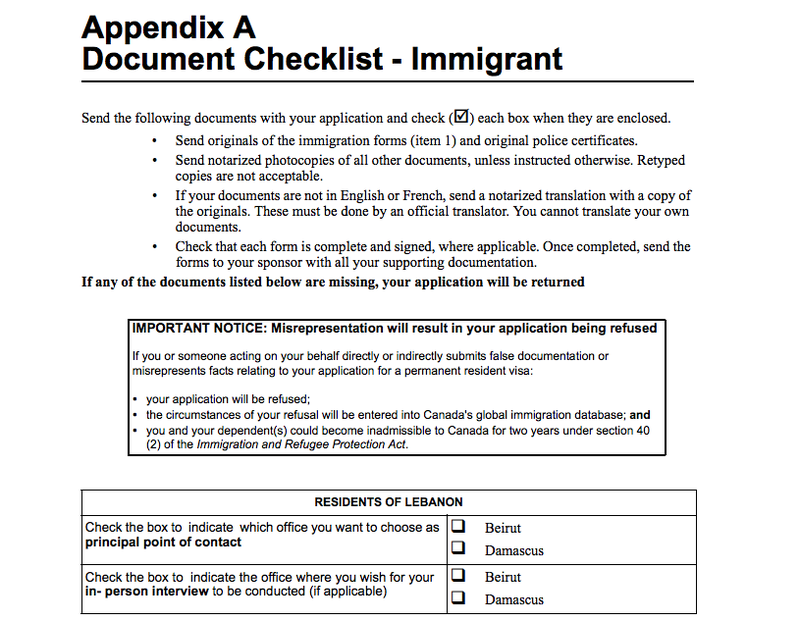 Below are five “layperson” tips for papering (or digital papering) an immigration file. In too many consultations, I run into individuals who don’t keep accurate records of their immigration file. 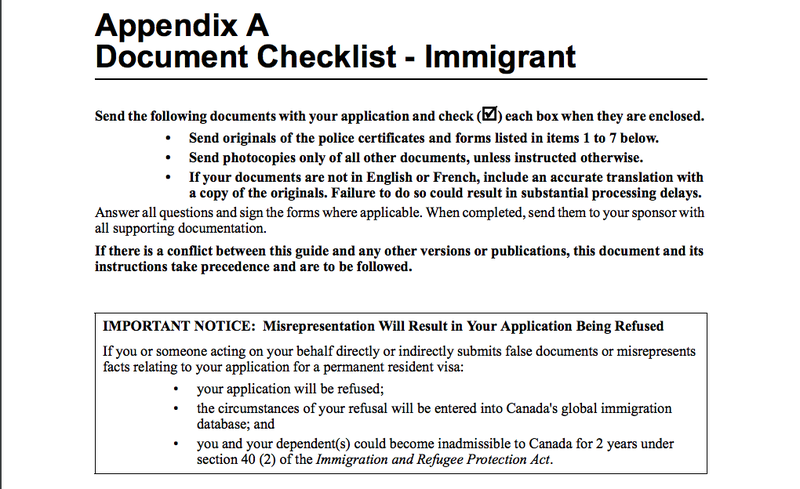 After a negative decision, they merely hold a one page-standard form letter from Immigration, Refugee and Citizenship Canada (“IRCC”) that frankly doesn’t provide even the starting point for what has happened. Many individuals do not keep copy of submitted forms, others lose correspondence, and I find few take proper screenshots of electronic applications. In the event of refusal or a request for further information, these paper trails are critical in defending one’s position. For example if a document is lost or claimed to be not received by IRCC, if you have no proof that you sent it you will have a difficult time seeking reconsideration or judicial review of a negative decision. For an example of this in IRCC policy see OB 265-A here. These are just two small examples of what I would say is currently the biggest non-legal barrier to successful immigration. The ultimate consequence of not papering is when you do seek legal advice, the lawyer/consultant will have to start at square one with your file. This involves obtaining an Access to Information request (“ATIP”) which itself will take at least 30 days and often more to obtain. During this period you may lose out on important deadlines – to respond to information, file an appeal, or file a judicial review as your case may be. Where a file has a long history, getting those documents may be further delayed by ATIP officers asking for an extension of time to deliver your documents. During this gap, there is very little to do but wait and see if no accurate records are kept. One of the challenges with many immigration applications and processes moving digitally now is that there is no longer a physical paper trail but a series of screened pages that may not reappear again. 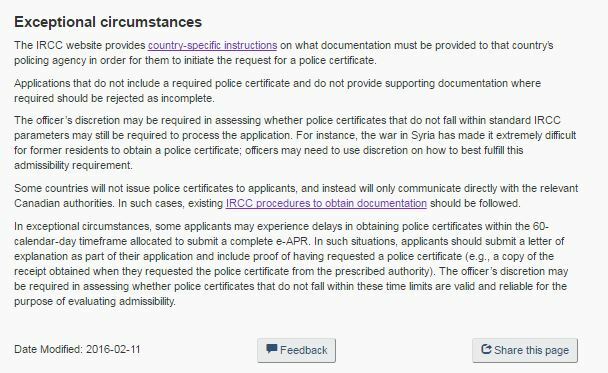 However, something like this short excerpt from a policy guide may be useful now, but perhaps by the time a decision is made on your application the website no longer exists or the policy has changed. This also is especially relevant when submitting online applications. For example, several online applications currently do not charge individuals correct fees and require an additional receipt upload or that have document checklists where you need submit 20 plus documents. Printouts showing what you have uploaded are very important and can often time be trigger points for self-identifying mistakes and deficiencies. Canadian immigration is becoming increasingly dependent on third parties, often times putting your future in Canada at the hands of a third party state police office or educational credential assessment companies. Mistakes can happen there and it is good practice to keep accurate records of all requests tied to your immigration record. For example, you may need to request a name change to an educational credential assessment or police certificate or even follow-up with a doctor to fix an upfront proof of medical certificate. All of these would not be possible without keeping accurate records of third party documents. This is also particularly important when dealing with Visa Application Centres or Provincial Nomination Programs which often have a line, but not necessary the most perfect line, of communication with IRCC. You want to have paper trails of communication in the event of any discrepancies or gap where information provided by one party can supplement information needed by another. When creating your paper folders/online folders it is important to properly number and folder your documents so you do not accidentally get duplicates. This is particularly important in the Express Entry process where you will have screenshots that you will need to take at the profile creation stage and later the permanent residence stage, each of which consists of hundreds of pages of information. Doing so also makes it more intuitive for an Officer trying to review your file. I have mentioned this before, but I personally believe to submit a complex file without a specific document checklist (not just the one provided with the application forms) is a disaster waiting to happen. Use (1), (2), (3) and (a), (b), (c) where appropriate and save a lot of headache from forgetting to upload or include required documents. In the immigration process, there are inevitably times documents need to go through revisions. Perhaps you need to ask your boss to write you a reference letter but that reference letter needs to be edited. Perhaps, you are working with a family member abroad who is working on a portion of an explanation letter for a family sponsorship. There are many ways to try and ensure drafts and final copies don’t mix. Some lawyers do a v1, v2, v3, final approach. Others I have seen keep a draft document folder that holds all unused copies. Regardless, nothing is worse than submitting a document that accidentally contains comments or is missing important information because it is a previous version. I recommend individuals to always submit PDFs as final copies and always label final copies as such. One of the musts I have come to realize is that documents need to be tracked upon exiting your hands and entering your hands. I strongly recommend self-reps to invest in a date stamp to properly make sure all official documents are dated. This is important especially if a document is snail-mailed by IRCC and is received by you several weeks after the date. In the event, your own deadline is coming up you may need to show proof that are still within the time frame to respond or initiate further action or request an extension as required. Second, I would suggest that when mailing immigration documentation (unless tactically otherwise), this mail should be tracked. Immigration applications contain several pieces of private information and particularly for overseas offices or domestic offices where there are many branches, it is easy to misdirect a piece of correspondence. Also, it is important to follow IRCC’s instructions and read them carefully when choosing what medium to response. For example, often times a response can only be sent by one medium only as indicated in a letter (i.e. return email). Other times there is no requirement, so it may be in the interest of an applicant to send it via two mediums to ensure a document is received and tracked. Finally, there may be times where there are no channels and other channels (case-specific enquiry, case review, MPs office, etc.) need to be contacted in lieu. Papering (or digital archiving) in Canadian immigration is increasing in importance. I have not even begin to touch on the other implications (for example Employer Compliance) which will be subject to future posts. Please contact me at will.tao@larlee.com if you ever have issues with papering/records. I have a good track record with reconsideration requests and I hope to help you moving forward! Canada’s historic mistreatment of Chinese migrants through immigration policy and law, though under-appreciated, cannot be understated. It began with the introduction of the Chinese Head Tax in 1885. This led to the Government to carve out the Chinese Exclusion Act of 1923. It was not until 1967, that race and ethnic origin were removed as a valid consideration of inadmissibility in 1967. However, even after this date – spouses of Chinese applicants faced greater scrutiny and heavier requirements. One would assume that in 2016, any government-endorsed effort (asides from the visa requirements that a nation is legally able to set out), that treats individuals of one nationality different than individuas of another may evoke some concern. I have ALWAYS denied that institutional-supported discrimination exists in Canadian immigration. Have I seen one off cases? I have certainly read my fair share of visa officer decision and member decisions that could have been much more culturally sensitive. In many of these cases, competent counsel took their cases to appeal and judicial review and won on those grounds. Rare wrongs that mostly were righted at the end of the day. Even, in the face of the May 2015 debacle where “uneducated” Chinese students in relationships with Canadian sponsors were revealed as a triggering characteristic for bad-faith/marriages of convenience, I somewhat accepted the then government’s response/defense. If there was a heavy incident of fraud among Chinese applicants, having an internal guide to try and shutdown the fraud can be somewhat justifiable in the circumstances. As well-documented, the current Liberal government is focused on “sunny ways.” Many of us can feel the many rays of light that this has brought – be it through increasing family class sponsorship numbers or ending several court interventions relating to immigrant rights. However, there are still some dark undertones in the system, recently updated and reviewed, that in my opinion still exist. Specifically, I think these elements project Chinese applicants in a negative light, reinforce negative stereotypes, and ultimately should be amended or eliminated in an effort to re-enforce the government’s commitments to the Charter and equality. As a bit of a juxtaposition, I want to put up the Visa Office specific checklists for two visa posts – the London Visa Office and Beijing, Shanghai, Hong Kong China (Chinese) offices for study permit applicants. These form the basis of supplemental documentation required by the Visa Office to make a decision on a particular application. In the event the picture is too small, the additional documents are made up of only a ‘proof of employment or current studies’, ‘evidence of previous studies and travel’, and proof of income. For purpose of study, only a CV and any additional documents showing why you want to study is required. Before we begin, a preamble. Unlike for London, for China we see immediately that Immigration is concerned about complete, truthful and accurate materials and failure to do so could lead to fraud. I have no qualms about this particular warning. I think the integrity of our system needs to be protected above all else. However, I do not think it makes sense to include this only on the Chinese form and not the form for other countries. Perhaps, China statistically has higher incidents of fraud than other countries. This is certainly something that needs to be addressed – and must be through greater regulation of those who are providing immigration advice. However, to slap a misrepresentation warning on one group because of a perceived reputation of that group is the definition, in my mind of, the word ‘prejudice.’ Imagine, if the goverment’s checklist warned all Middle Eastern study permit applicants that it was against the rules of immigration to be a member of a terrorist organization. The effect is the same here. For an applicant apply through the London Visa Office, there is no requirement for the disclosure of information relating to the applicant’s mother and father. As this application does not age discriminate, even a 30-year old applicant must provide information about his/her father and mother in order to meet this requirement. 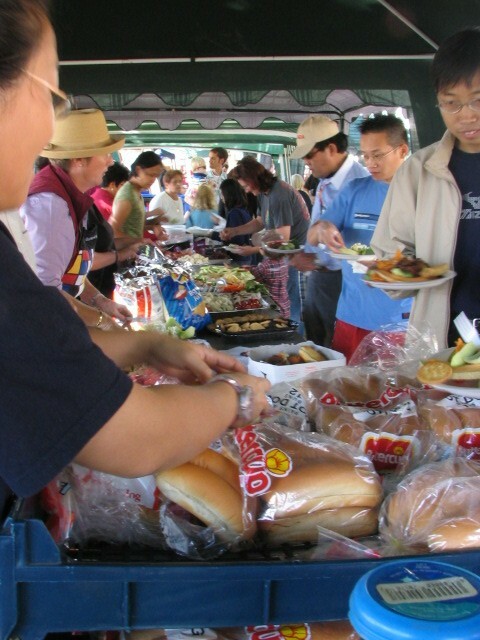 From my perspective, this is a view of an Asian ‘student’ as being an individual low on self-reliance and self-independence – inexplicably tied to their family rather than to self. Again, I have no qualms with requiring each family member to fill out a form – but should this not be a global requirement for visa offices? Next, a study plan. Note that is much more detailed than the one for London. Finally, you have a list of notarized documents, for college, senior high school, and including all transcripts. From a cost perspective, notarized documents with certified translations can run up to 400-600 RMB (equivalent to CDN 100-150) per document. 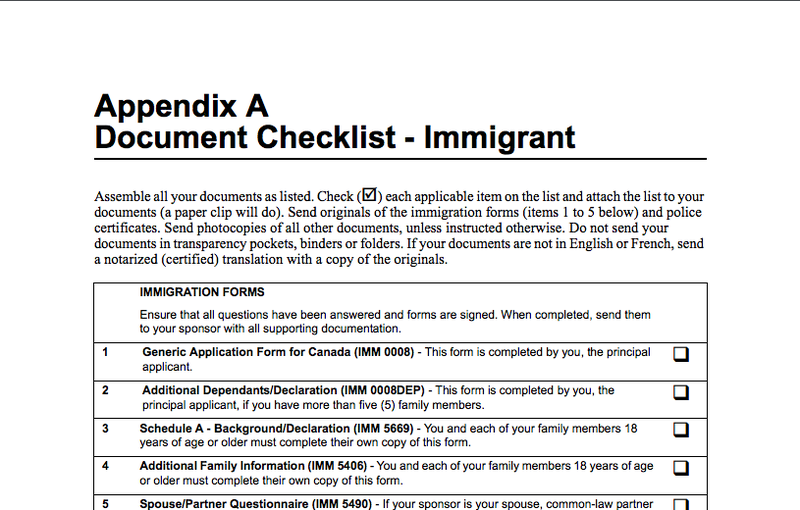 Easily making the immigration process an additionally CDN $1000 more expensive. For applicants who have not already visited Canada or the United States on a valid visa, the document requirements are even higher. We see again, a concern with not only the Applicant’s employment put the employment of the parents and any financial support. The details required to be divulged are quite detailed. In fact, the checklist gets detailed to the point of requiring that if an applicant’s parents must provide details about their business registration. In my opinion, if you make this a requirement for one, it should be for all. 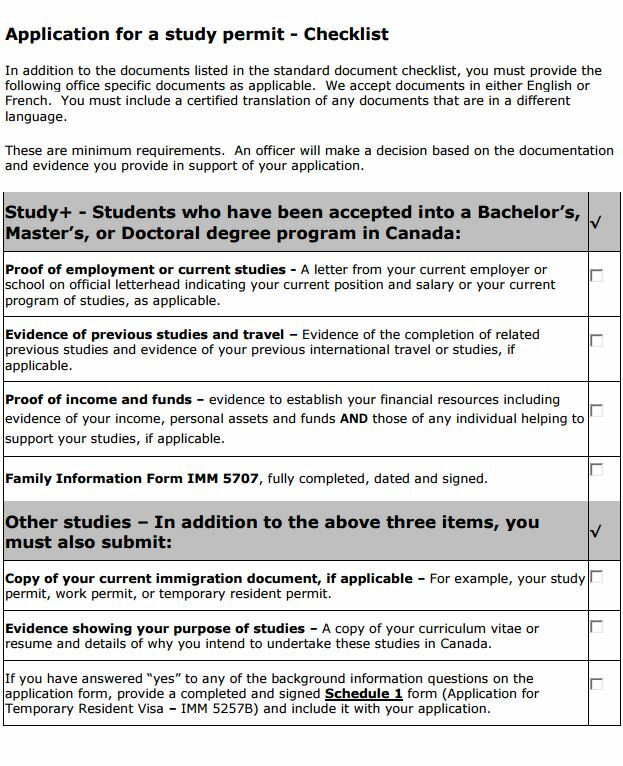 Furthermore, I would suggest that the students that you genuinely want in Canada are those who may not be able to shell out CDN $1000 for transcripts, whose parents aren’t necessarily bankrolling their education or running businesses, and who wish to study here on their own merit. None of this is contemplated, within the supplementary form. This creates several challenges, particularly where you have a potential student applicant who may not be under the care, auspice, or even favour of their parents in trying to pursue Canadian education. 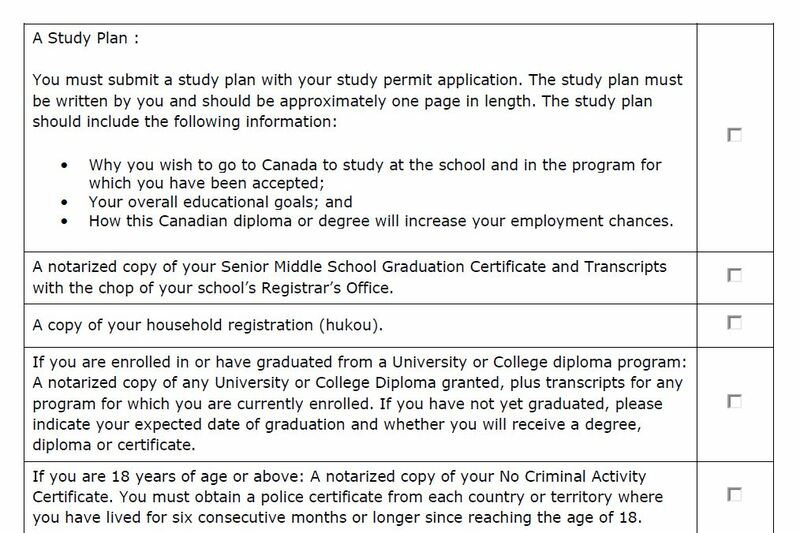 Beyond the study permit context, there is also a similar type message for Canadian/PR spouses sponsoring their loved ones from abroad. Other than the fact that the 2-years for misrep should actually say 5-years (as of the January 2016 date that it was last update), I have serious concerns with the implication of warning one group but not another. 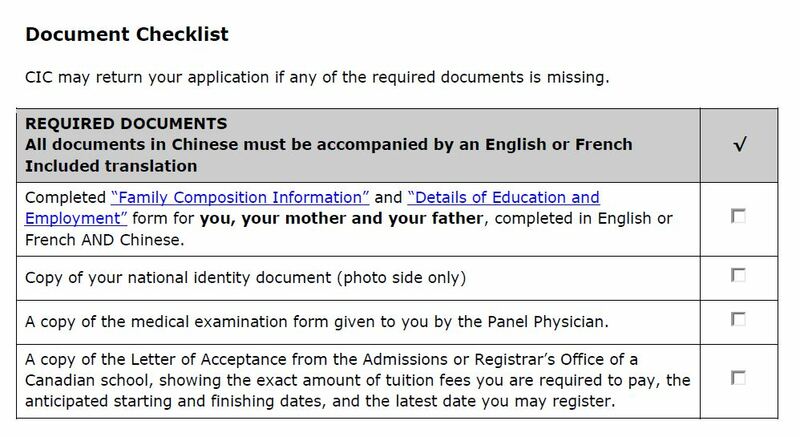 As this is a guide for both sponsors and applicants, as a future sponsor of an applicant from China, I feel like I am beginning purposely pointed out as a potential for fraud simply based on the nationality of my future spouse. Indeed, it you want to read into a little more the box is even bolder in font for Middle East and Central Asia warning of misrepresentations. Accident or not, it is clear and obvious that the visa office requirements, and by extension the Canadian immigration system, is not treating all applicants similarly. Perhaps a defense that may be raised to the hierarchy of ‘distrust’ argument, is that India’s guide does not discuss fraud, even with it’s pre-existing reputation. If it is indeed, right now, the decision of individual visa offices to choose the content on their office-specific forms, I would argue that more harmonization is desperately needed. In my opinion, a fair and just immigration system treats applicants and potential applicants as fairly and equally as possible without pre-conceived notions as to who they may be and what they may do, without evidence. Warning an applicant from a particular country or region without warning another is a preconceived notion. The fact is these requirements, directly affect results as well. I have seen more than one refusal decision where an female applicant from China was called “young” and “mobile”, leading to the conclusion she would not leave after the end of her intended stay – a requirement for temporary residents. Furthermore, the documents themselves pose major privacy and even evidentiary issues. The more evidence an applicant provides in an immigration context, inevitably the more scrutiny they will face in so-doing. From an applicant’s perspective, the more they are being scrutinized, the more they will think that there is a distrust of them. Additionally, the document quality standards in most countries pale in comparison to the Canadian standards. In many countries and particular poorer/less affluent regions, translations into English/French are not accurate and prohibitively expensive. Fraud needs to be combatted, but at the same time it needs to be done in a way that equal, just, fair, and upholds the value of our Charter – one that does not discriminate by nationality.